Scuba divers across Thailand have reported the sharks they see on every dive to eOceans - this includes dives where no sharks were observed. See results of this study posted HERE. In 2012, this project was spearheaded by Shark Guardian, a non-profit education organization that operates in Thailand. This nation-wide project was instrumentally supported by dive guides, dive tourism businesses, and other community groups throughout the region. Thousands of dives. Thousands of hours. Both coasts. Across Thailand, on both the Andaman Sea and the Gulf of Thailand coasts, 9,524 dives were logged — for a total of 9,357 hours underwater. Essential support by dive guides and dive shops. Dive guides and dive shops were instrumentally involved in the process of this nation-wide census. Dive guides reported their observations to eOceans. 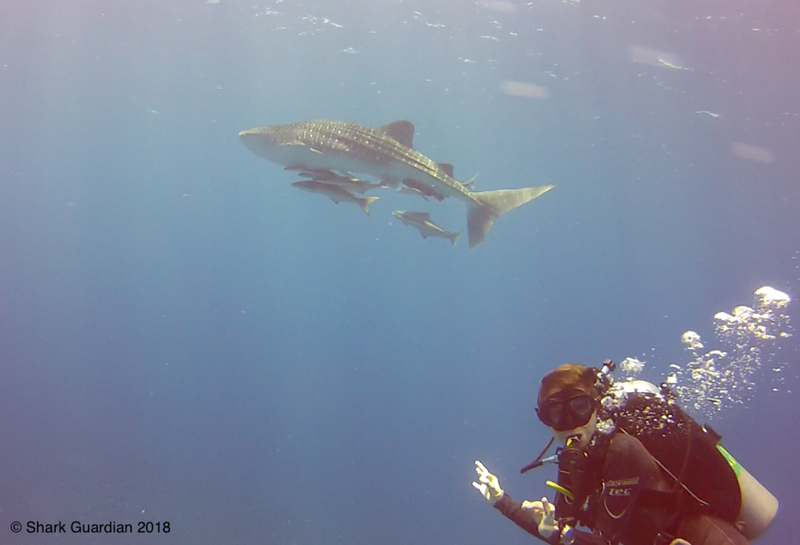 As well, dive guides and dive shops encouraged visiting divers to participate by offering Shark Guardian educational materials, which included information on reporting their own observations to eOceans. Thousands of sharks. Including endangered species. Mostly as individuals. 11% of all dives had sharks. 59% of 153 sites had sharks. 12 shark species were encountered - 67% as individuals. This includes 2 endangered species - leopard (or zebra; Stegostoma fasciatum) and whale sharks (Rhincodon typus). Results are already being used by biologists, fisheries scientists, and managers to prioritize conservation strategies. This unprecedented effort demonstrates the desire of individuals to get involved, and the value of collaborative projects in support of marine science and conservation. eOceans wants to acknowledge every contribution made by every individual to this, and other eOceans projects - we appreciate every dive submitted. However, we are also committed to privacy. Please see acknowledgements in the paper. If you were part of this amazing effort to census sharks in Thailand, and want to share with with your social networks, please use #eOceans #SharkGuardian and #CitSci, so everyone can follow along too. eOceans unites the global community of ocean explorers to create the world’s most versatile dataset for science and conservation. We amplify our collective experiences. For the Oceans. For Us. Shark Guardian provides shark and marine conservation worldwide through education programs, research projects, and exciting diving expeditions. We promote collaborative efforts between all ocean explorers and experts in science and education. Together, we collect, analyze, and interpret data relating to the marine world to unravel ecological, social, economic, and management issues affecting our oceans.